This book examines how the prominent Muslim scholar Said Nursi developed an integrative approach to faith and science known as "the other indicative" (mana-i harfi) and explores how his aim to reconcile two academic disciplines, often at odds with one another, could be useful in an educational context. The book opens by examining Nursi’s evolving thought with regards to secular ideology and modern science. It then utilizes the mana-i harfi approach to address a number of issues, including truth and certainty, the relationship between knowledge and worldview formation, and the meaning of beings and life. Finally, it offers a seven-dimensional knowledge approach to derive meaning and build good character through understanding scientific knowledge in the mana-i harfi perspective. This book offers a unique perspective on one of recent Islam’s most influential figures, and also offers suggestions for teaching religion and science in a more nuanced way. It is, therefore, a great resource for scholars of Islam, religion and science, Middle East studies, and educational studies. "Through its unique perspective and meaning-acquiring (mana-i harfi) approach, this book fills an important gap in scientific literature by making sense out of seemingly senseless natural phenomena. It provides the means to go beyond the visible, and explore the rich and colorful invisible in the backstage. It attempts to compose a cohesive book out of the piles of words of sciences and shows that beings are meaningful sentences. It helps the reader to see the big picture which merges the physical and non-physical realms and guides them to author their own meaningful book of the universe. A must-read book for those trying to find meaning in life and creation." "Dr. Aydin has written a thoughtful, engaging, and solid critique of the concept of character building drawing on Said Nursi's Risale-i Nur. This is the definitive book on this subject; the research is impeccable, the argument intriguing, and the conclusions solid. It will be a landmark text for years to come." 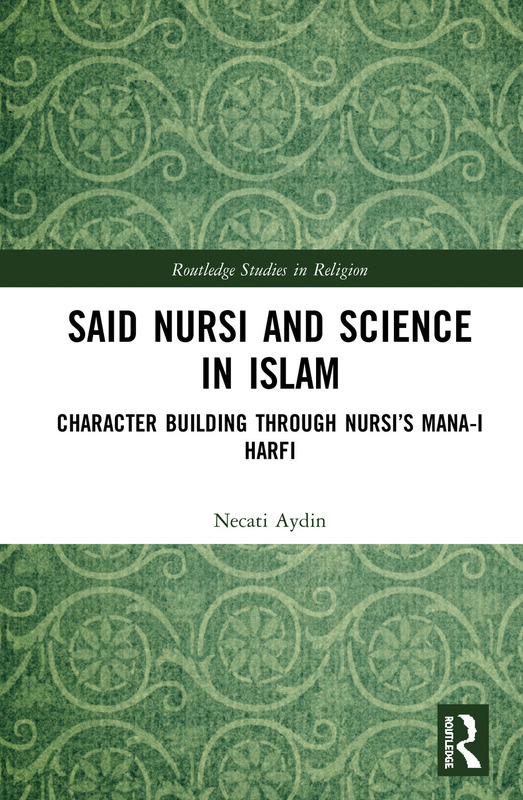 "Said Nursi and Science in Islam: Character Building through Nursi’s Mana-i harfi by Necati Aydin is a systematic and thorough analysis on the comprehensive ideas on the nature of science and the Universe and personal secular and spiritual experiences of Said Nursi, one of the most powerful Muslim reformers in modern Islamic world who is still relatively unknown especially among English speaking audience including Muslims. The challenges posed by secular worldview, the various levels of knowledge, realities, and truth and the integrated method --which the author calls tawhidi--of attaining and teaching them are carefully discussed with the final objective of inculcating a multi-faceted human personality who is deeply God-conscious and able to properly contribute to World Community. This admirable effort by Dr.Aydin on Nursi’s religious interpretation of science is a positive contribution not only for Muslims worldwide in their still unsuccessful attempt at facing the cultural challenges of modernity but also for many others who seem to view committed Islamic discourse such as Islamization from the limited prism of geopolitical and legal perspectives." Wan Mohd Nor WAN DAUD Former Founder and First Director of Center for Advanced Study of Islam, Science and Civilization (CASIS), University of Technology Malaysia, Kuala Lumpur. "This engaging addition to the field of pedagogical theory from the pen of Necati Aydin throws much-needed light on the epistemic binary of self-referentiality/Other-indicativeness, which runs like a leitmotif through the works and teachings of Bediuzzaman Said Nursi. Dr Aydin is to be lauded for his timely gift to Muslim scholarship on the relationship between Islam and science." "Necati Aydin's new book offers a close philosophical analysis of the epistemic framework for Said Nursi's critical engagement with modern thought. It provides the wider world a much needed, lucid and in-depth access to the ideas of one of the most under-appreciated geniuses of modern Islamic thought." "Necati Aydin offers especially the western scholar an approach to Said Nursi and the subtle relationship between science and religion. The globalization process is in need of such a book to provide an opportunity for a new orientation. It expands the narrow view, dividing science and religion, as being antithetical. Here we find cues that an alternatives perspective dealing with modern science and religiosity (and spirituality) is possible." "Bediuzzaman Said Nursi is a widely known but poorly appreciated giant of Islamic scholarship in the modern era. One way to misunderstand his thought is to interpret his engagement with science as a "scientist" take on modernity. The present study offers insights about both his critique of positivist science and the solutions he develops to escape its built-in entrappings." "This book is about one of the most important concepts of Bediuzzaman Said Nursi who is well known by his magnum opus, faith-based, Qur’anic commentary called The Risale i Nur , Epistles of Light. Nursi employs many new concepts and metaphors in his writings to provide a convincing argument for the existence and unity of God. He offers a new paradigm based on the combination of revelation, prophethood, and the reading of the universe. For Nursi, the universe is an elegant book of God to be reflected by the heart and mind. He offers the mana-i harfi approach to read the book of the universe. It might be fair to consider the mana-i harfi approach as a paradigmatic shift in the teaching of faith to the modern mind. I praise Said Nursi and Science in Islam for being instrumental in guiding those who search for God through science and revelation." "This book presents Said Nursi's vision of a God-conscious conception of the universe as an alternative perspective on modern science. As such it offers a Nursian formulation for a post-secular approach to undoing the alienation between science and spiritual meaning. A welcome contribution to the literature on Said Nursi." "Bediuzzaman Said Nursi is a very prominent and influential Islamic scholar. However, his profound, complex and critical thoughts on the philosophy of science and the study of the universe are often misinterpreted and remain largely unexplored. That is why Dr.Necati Aydin’s present work is a welcome venture. It offers precious insights on a key concept, namely on ‘mana-i harfi’, lit. indicative meaning. This is a very powerful conceptual tool that provides a structural framework for organizing knowledge in a way that reveals the Transcendent dimension of reality. Mana-i Harfi distills the Quranic approach of reading the signs of God in the world and uncovering the beautiful divine names reflected therein. In this book, Dr. Aydin explores the significant process through which Mana-i-Harfi transforms various forms of knowledge into a knowledge of the Transcendent." Necati Aydin is a professor of economics at Alfaisal University, Saudi Arabia. He has two doctoral degrees, one in education, and the other in economics. He has taught at different universities in USA, Saudi Arabia, and Turkey, and has published several academic articles on Said Nursi’s ideas. He is a founding board member and executive director of the Nursi Society.